TBBCA is holding a special Cultural Encounter with nationally recognized folk-artist Ruby C. Williams. Miss Williams is the TBBCA 2017 Lifetime Artistic Achievement Impact Award Honoree! 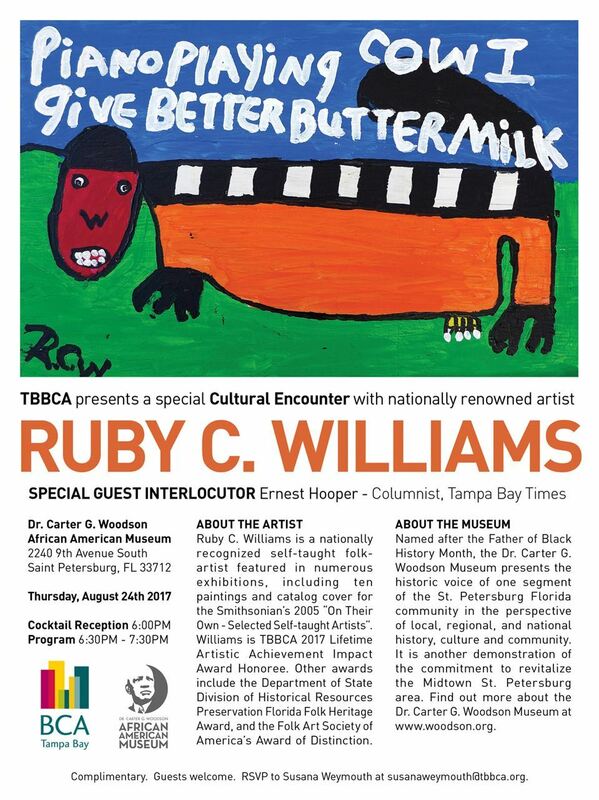 There will be a sponsored reception followed by a short program featuring Ruby Williams in dialogue with Tampa Bay Times columnist Ernest Hooper, all taking place in the beautiful setting of TBBCA's Cultural pARTner, the Dr. Carter G. Woodson Museum in St. Petersburg. For this one night only the Woodson will exhibit specially selected artworks by Ruby C. Williams on loan from private collections.